all over the world and tends to increase the prevalence. cord) and peripheral (spinal nerves, muscles). 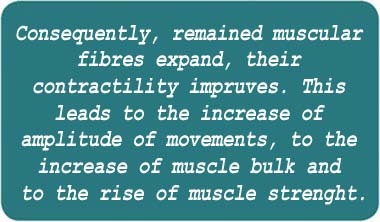 Raised muscle tone, blood supply disturbance and other factors cause dystrophic process in skeletal muscles. The dystrophy leads to death of a part of muscle fibers and to the substitution of these fibers by connective tissue. So fibrous scars which cause restriction of movements and regional pain syndrome (in connection with the growth of a child and scar tension) are formed. Pain syndrome promotes formation of the antalgic posture (at the expense of tonus rising in certain groups of muscles). The vicious circle is formed: raised tone – restriction of movements – muscle dystrophy – formation of connective cicatrix – muscular contracture with a regional pain syndrome – muscle tone rising – more pronounced restriction of movements. Operative intervention on pathologically modified muscular fibers is capable to break this vicious circle. Discission of fibrous cicatrix in a muscle eliminates regional pain syndrome and pathological tonus caused by it, remained muscular fibers have an opportunity to contract and to stretch normally – muscle function and its blood supply improves. Consequently, remained muscular fibers expand, their contractility improves. This leads to the increase of amplitude of movements, to the increase of muscle bulk and to the rise of muscle strength. During the operation it is important not to injure normal muscle fibers which side pathologically changed fibers. 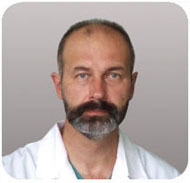 This result can be reached by application of special cutting instruments and by exact actions of the surgeon. Surgical instrument allow operating without big skin incisions. These operative interventions only on pathologically changed muscular fibers allow making it without applying plaster immobilization in the postoperative period and activating the patient soon (on the 3rd-4th day after operation). presence of organic muscular contractures and myofascial pain syndrome, which cause permanent disability of muscular functions. condition after vaccination – not earlier than in a month. and palpation he reveals cicatrical bands and tender points; thirdly, immediately before surgical attack when the patient is under anesthesia, at the time of muscles relaxation ( when cicatrical bands are well-marked) – the orthopedist palpates muscles again, checking evolved plan of surgical intervention. A doctor, like a sculptor, should foresee the result of the operation, lay down a blue-print of rehabilitation actions with obligatory control of patients’ achievements and he should predict: when and on what muscles next stage of surgical intervention must be made. Surgeries in early stage of muscular contractures before nascence of fixed contractures and deformation of joints are most effective. That’s why it is preferably to begin surgical treatment at the age of 3-5. It’s worth noting that well-timed surgical intervention promotes not only the increase of range of motions of a child but it also promotes improvement in general state of health, growth, nurture of mind (as a result of increase in mobility and minimization of pathological impulsation from the muscles which underwent surgery). Correctly organized post-operative rehabilitation improves productivity of surgical treatment and plays a very important role in improvement of impellent possibilities of a patient. Within a month after surgery a patient gradually enlarge his motor abilities to the level, that was available before surgery. 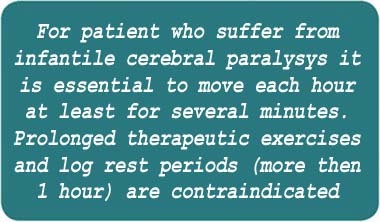 As the pain syndrome is falling, exercise therapy and passive gymnastics are recommended to the patient. For those, whose range of motions in joints is limited because of permanent pathological postures, passive gymnastics is essential. Little by little patients should pass to passive-active and active gymnastics. It should be noted that the main target of therapeutic exercise is to stimulate various motor activity, without causing fatigue. For this purpose it is possible to use various physical exercises and training simulators which are adapted for possibilities of ICP patients. Activity duration should correspond to a physical condition of the patient: from 10 to 30-40 minutes). If there are some indications of weariness, exercises should be stopped. After relaxation exercises should be repeated. The muscles have adequate exercise stress that promotes development of physical mass and muscular strength of the patient. prolonged immobilization of the extremities and the trunk.